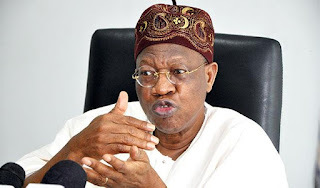 Minister of Information, Lai Mohammed, has reacted to PDP’s statement condemning the Federal government’s decision to withdraw $1 billion in a bid to fight Boko Haram. The minister blasted the party, saying they lack shame. According to the Minister who said the party is currently rebranding itself with stolen arms money, if the money meant for the prosecution of the war against Boko Haram wasn’t stolen, there wouldn’t have been any need to withdraw such an amount of money from the excess crude account. The PDP under Jonathan in one day distributed $269 million cash and N100 billion which was supposed to be money meant to fight Boko Haram. The sad thing about PDP is that they do not know when not to talk. If they were smart they would know when not to talk. If not for their rapacious corruption, Boko Haram would not have metamorphosed into the monster that it became before we came in. If only they had approached governance with honesty transparency, and sense of purpose, Boko Haram would not have raged between 2009 and 2015, it was their inept handling of Boko Haram and their corruption that put us in this mess. ‘They seem not to understand that the biggest challenge to any government and the primary responsibility of any government is law and order and security. It is because of the fact that we have been able to contain Boko Haram that they were able to hold their national convention in Abuja. During their time they were not able to celebrate the National Day openly. Under their watch, Boko Haram not only occupied 27 local governments in Borno State, but was also active in almost ten states. Not that alone, they used to stroll to the federal capital, and three times they went to bomb the United Nations, the Police headquarters and under their watch, the Thisday newspaper was bombed and under their watch, about 200 Chibok girls were abducted’. Why do we say that we have decimated Boko Haram? It is not propaganda. Since we came in 30 months, there has been no single bomb explosion in the Federal Capital, and that is not a mean feat! It is because they don’t understand what security means, they don’t even understand what terrorism means. It does not lie in the mouth of the PDP to even criticise the government, and it was their corruption that led us to where we are today. They are spending the same money which they stole, and they are using the money to rebrand themselves, they have no moral justification whatsoever,” the minister fumed.